Lending Money: Our Only Business for over 100 Years! Citizens Savings & Loan is one of Tennessee’s oldest consumer finance companies! We provide a variety of personal loans and there is no minimum credit score requirement for a loan approval! Let us help you get into a new ride with a car or truck loan from Citizens Savings & Loan. No credit? Bad Credit? We can still help you get approved! From unexpected medical bills to home improvements to buying or repairing a vehicle... Whatever the reason may be, Citizens Savings & Loan has been here to help for over 100 years! Apply for a debt consolidation loan from Citizens Savings & Loan today and combine all your existing payments into one manageable monthly payment! Citizens Savings & Loan Corporation is one of Tennessee’s oldest finance companies providing consumer loans to people that may have credit or collateral challenges. You do not need a minimum credit score to receive a loan approval at Citizens Savings & Loan. For your convenience, we’ve created a simple online loan application to help you get started. 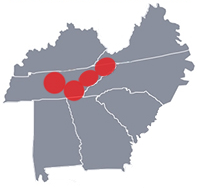 We would also love to meet with you in person at one of our Tennessee and North Georgia office locations. Come see or talk with us today about a loan that is right for you! Want to Learn More About Your Credit and Lending Options? We Have the Experience to Help! Citizens Savings & Loan is committed to educating our customers about the wise use of credit. Citizens has been lending to people just like you for over 100 years... we have the knowledge and experience you are looking for to help! If you would like to learn more about how to use credit, how to lower your total debt, or how to improve your credit score, please check out our resource page.